Timothy Barnes, 31, has been arrested in Indiana for stealing tsunami and other charity donation cans, along with the money in them. The ignominious actions were caught on videotape at various convenience stores in the state. Barnes now faces charges in three counties for his idiotic and outrageous thefts. Barnes entered a Village Pantry store -- where owners had a large donation can on the counter to collect money for tsunami victims -- looked around, and took the can with him out the door. 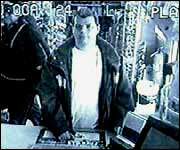 The bumbling, vacuous, conscienceless thief also hit several Speedway gas stations with the same actions. And if stealing money from tsunami victims wasn’t enough, he also took donation cans that were collecting money for a local children’s hospital. Yeah, Barnes has NO conscience whatsoever. And apparently the idiot was so focused on stealing the petty cash from the needy that he didn’t notice the multiple surveillance cameras that were watching his every move. Well, too bad Barnes, the store owners noticed, and so did the police. Stealing money from tsunami victims and sick children makes you a BIG loser, and a criminal. Perhaps you will begin to wake up when the judge sentences you. My God, you are sick Barnes!